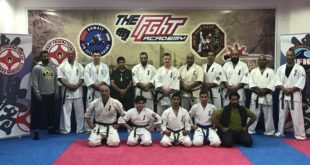 Kuwait 6th training camp with Shihan David Pickthall 6th Dan was an excellent experiance. 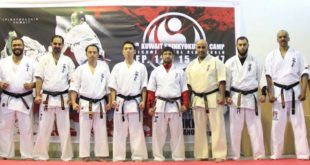 The level of techniques, knowledge and spirit which Shihan David gave very generously resulting in this camp to be one of the most successful camps of IFK Kuwait. 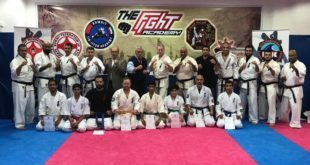 There was a visit from the Kuwait Committee of Kyoushin Karate derived from the olympic committee president Sensei Basel Al-Banay 3rd Dan who welcomed Shihan to Kuwait and express how much he was pleased with the level of training and organizing of the camp. The KFK congratulates Senpai Abdullah Al-Khurafi on being promoted to his 1st Dan and Bader Al-Mezyad, Saud Al-Amiri on his 1st Kyu we wish him the best in the future we also thank Senpai Bader Al-Beshir for his hard work in preparing them for the grading.